RIGHT. ENOUGH. TIME TO ACT. WE PRESENT ‘THE BREXIT HIT-BACK PACK’! RIGHT. 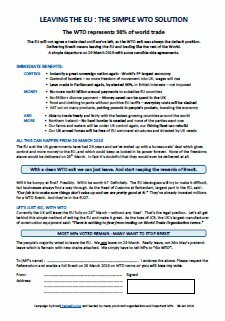 ENOUGH... TIME TO ACT... WE PRESENT ‘THE BREXIT HIT-BACK PACK’! When we first started criticising her on this site, we found ourselves being criticised for not giving her a chance. Today there can’t be a single Leave-voting member of the Conservative Party who supports her…. To say nothing of all the voters of other parties who think she’s completely hopeless. It’s now time to hit back. She needs to be told. MPs need to be told. And we’re giving you the tools to do just that. 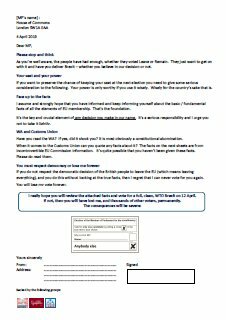 We cannot urge you strongly enough to print off this pack and send it to your MP today. You may wish to write your own covering letter – and we recommend this – but sending the factsheets with your letter will hit the MPs hard. 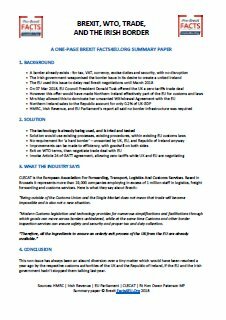 The new 1-page factsheet on the Customs Union – a proposal now being discussed between Mrs May and Marxist the Rt Hon Jeremy Corbyn MP – contains the latest data from the EU itself, showing how a Customs Union has failed to benefit the UK. Not only that, but a Customs Union is an integral part of EU membership, which the majority of the electorate voted to leave in 2016, and which the major parties promised we would leave in their 2017 manifestos. We strongly recommend you do both. Sending by email is now necessary because events are moving so fast. HOWEVER, we ALSO urge you to print and send the pack by post too, because MPs receive thousands of emails each day. These are easily ignored, but when their offices are overflowing with post they find this much harder to ignore. You can find all contact details for your MP here, in our original ‘Brexit Battle Pack’ that we produced last summer. 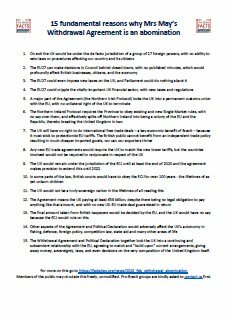 We are also working with other Brexit groups seeking their endorsements and promotion of this initiative today. Already some excellent groups have come on board – Global Britain, Scots for Leave, Alliance of Brtish Entrepreneurs, The City for Britain, Get Britain Out, and Better Off Out. The disconnect between Parliament and the people has never been more stark. Please don’t wait until it’s too late. Please don’t expect others to do this so you don’t have to. We had magnificent responses to our previous campaigns. Let’s make this one the most powerful ever! Let’s inundate our MPs with facts and a huge dose of democracy! Quick and secure donation options are below. They all contribute to our work - we don't have secretaries nor expensive London offices. You haven't given up fighting for the full, clean Brexit you voted for. Together we're up against a vast army of UK & EU Remain propagandists. 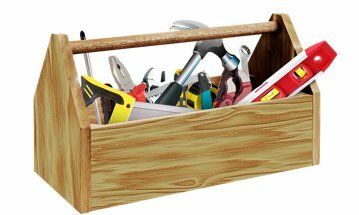 All we have are our honest tools - detailed research, compelling daily content, simple charts, lobbying MPs - and our most important resource - you. We have the support of MPs, MEPs, and many other Brexit groups, and our work has impact. It presents a simple, positive, and factual case for a true Brexit NOW. May I suggest also writing to the Chair of your local party associations. My MP Greg Clark ignores my letters, but he receives grassroots feedback from the local association. I have also replied to Alan Mabbutt OBE, Director General, Conservative Party, who emailed, asking for volunteers to help in the forthcoming local elections. 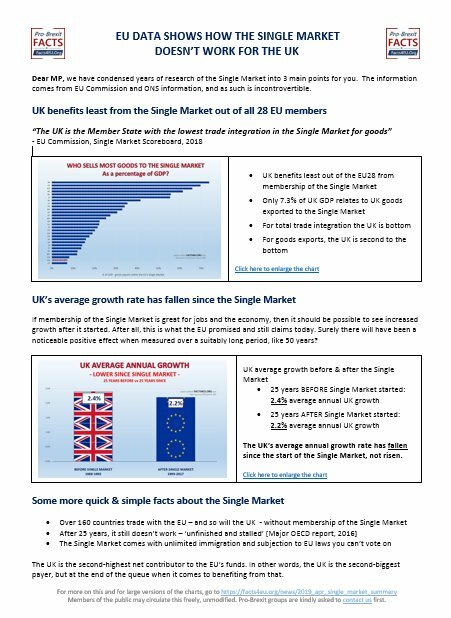 Excellent (irrefutable) factsheets. Thank you. The Extension - BETRAYAL, takes us closer to the next general election, which will keep this act of betrayal fresher in the minds of the electorate. Letter printed, signed, sealed and about to be delivered. Please everyone, let's do this! Any further extension and the Conservatives are a dead party and good riddens. Sadly there are still several Conservative party members worth their salt and I hope and pray that they survive and prosper when the current PM destroys the Conservative party and country by her actions. As reported on SkyNews earlier, it appears Germany now regard Bercow as a hero. It makes me sick to the stomach that MPs have trampled all over the electorate following a LEGAL referendum. 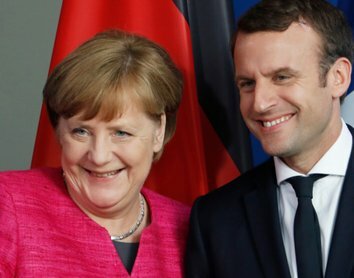 Just think about this, Germany invaded the continent decades ago, and it was the UK alone who went to the continent to fight to liberate THEIR freedoms. Later to be joined by Soviet Russia, then the US following Pearl Harbour. The world was at war. The continent was liberated, now the continent turn on the UK. It is time to bring back home ALL service personal and military hardware, and not to share further information with foreign unaccountable bureaucrats. Be in no doubts, that as much as I try to moderate my own language, treacherous MPs will pay a heavy price come next elections, because the one thing the electorate have is POWER at the ballot box. Then again, why should we trust a single word they say any longer. MUPPETS, THE LOT OF THEM (with exception to those democratic MPs who accepted the democratic referendum result). 544 MPs voted in favour of holding the referendum (so they knew it would go either way)? 498 MPs voted in favour of allowing the Prime Minister to trigger Article 50 after an expensive court battle (so MPs knew exactly what they were doing)? 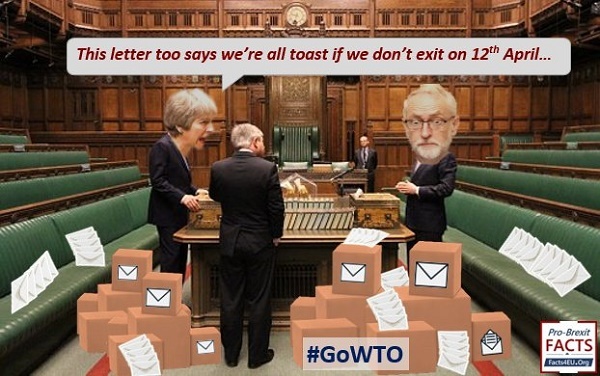 By a majority vote of ONE single MP, they have taken 'no-deal' off the table. You NEVER do that in business. So MPs have effectively handed the keys of UK Plc to Brussels, aided and abetted by MPs who never accepted a legal outcome. They continue to trash our country from within. One thing we can do is BUY BRITISH, FROM BRITISH OWNED COMPANY'S, and from those who believe in our country - the rest can find their own place in hell (as Tusk may suggest). Very well said Jon in Wales. The political establisment disgust me to the core. They are clearly working in conjunction with the eu and ignoring the 17.4 million people who voted in the most historic vote in the history of the country. Hardly have the 'indicitive votes' failed then the BBC switches to their 'correspondent' in Brussels for comment! It is clear to me the 'Withdrawl document' is take in dictation and is a mere surrender document. "Hammond: Second referendum is a 'credible proposition'"
He needs to be deselected too. What an 'useful idiot' - I guarantee another referendum would be a landslide for leave. What then Mr Hammond? Oh ..... er they have to vote again as that's the wrong answer? How many more referendums will it take? This country does not deserve such lousy politicians. The Conservatives ..... what a record for history Iraq, open border madness, LGBT teaching in all schools and so on-------- these are not real Conservatives. God save the country from the current political class. The "European Union Referendum Act 2015" sponsors were Philip Hammond (then of Foreign and Commonwealth Affairs), and the Baroness Anelay of St Johns (then of Foreign and Commonwealth Affairs. The Act was given Royal Assent (RA) on 17 December, 2015. The passage of the Bill was scrutinised in depth prior to RA. For remainer Philip Hammond to now condone a second referendum is an insult to the electorate, and to Parliament itself, and must be firmly rejected. 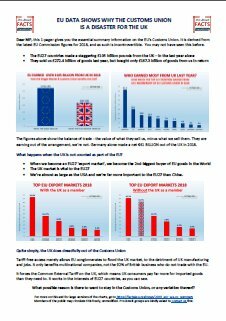 I've made a further donation to Pro-Brexit Facts4EU.org to help them continue bringing us OFFICIAL FACTS which cannot be challenged. I hope other readers will join me in donating, be it large or be it small - It all adds up to help our common cause. Thank you.